Looking for Peach Cobbler Recipe: Easy and Great Tasting Peach Cobbler, with Step by Step Photos in 2019? Scroll down this page and follow the links. And if you bring home some fruit or vegetables and want to can, freeze, make jam, salsa or pickles, see this page for simple, reliable, illustrated canning, freezing or preserving directions. There are plenty of other related resources, click on the resources dropdown above. Peaches are not only great fresh; they are also fantastic in cooking and desserts, too! Peach cobblers and crisps are a couple of my favorite summer desserts! 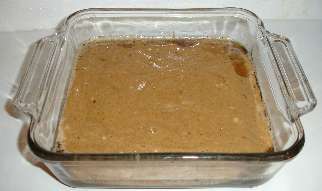 They are similar; both are shallow pans of fruit and some flour or grain thickener, with a sweetener. Some cobblers are made with the flour on top of the raw seasoned fruit and baked; while others mix the thickener and the sweetener with the fruit and heating it and then put the flour topping on last. Crisp are usually uniform mixes of fruit and grains, like oats. 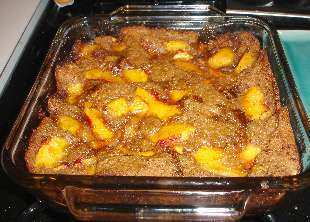 The recipe below is for a REALLY easy peach cobbler, that tastes great! You can add 1/2 cup chopped pecans - they taste GREAT in a peach cobble. You can also add other fruits: blueberries and blackberries are particularly good in combinations with peaches. Just add 1 cup of either to this recipe in step 6. Preheat oven to 350°F (175 C). Wash, peel and slice the peaches. You can slice them thin or thick as you prefer! Note: you can dunk the peaches in boiling water for 45 seconds, then into ice water, and the skins will usually slide right off. 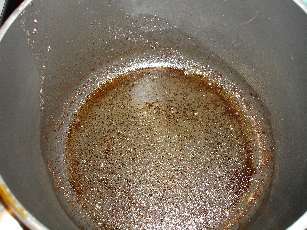 Melt the stick of butter in a medium saute pan over medium-high heat until it bubbles and turns golden-brown. Be careful: it will burn quickly and easily! 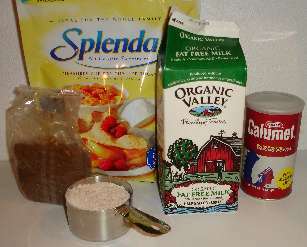 In a medium bowl, stir together the 1 cup sugar (or Stevia (in a prepared form like Truvia, it measures same as sugar; if you use another form, you'll need do your own conversion) - or Splenda, if you prefer, , or blend), the 1 cup flour, 1 tablespoon baking powder, 1/2 teaspoon cinnamon and 3/4 cup milk. 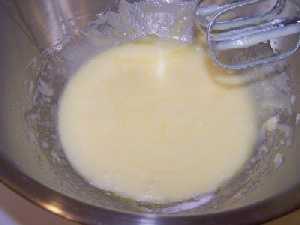 Pour the batter on top of the melted butter. Do not stir. Note: the photo shows a dark brown batter because, instead of 1 cup sugar, I used 1/2 cup Stevia (in a prepared form like Truvia, it measures same as sugar; if you use another form, you'll need do your own conversion) - or Splenda, if you prefer, and 1/2 cup brown sugar; just to cut the calories some. Without mixing, arrange the peaches evenly on top of the batter. Evenly sprinkle the brown sugar over the cobbler. Bake the cobbler for 40 to 45 minutes at 350 F (175 C), until the top turns golden brown. 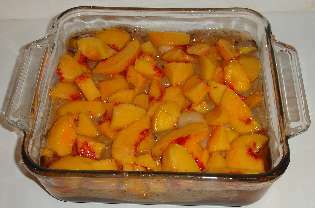 The batter will migrate from the bottom of the pan to cover the peach slices partially. 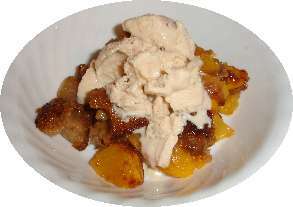 Serve warm or at room temperature; preferably with peach ice cream. Yield 6 to 8 servings. 1. About 2 medium to large peaches = 1 cup sliced peaches. 2. About 4 medium peaches = 1 cup pureed peach. 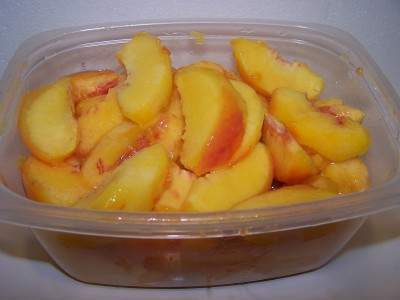 A visitor writes on August 22, 2013: "I wanted to take a moment and thank you for the excellent peach cobbler recipe. I had never made it before but tried it today and it was so delicious, especially with the fresh peaches. Also, I had never made peach jam before but did earlier in the week. Unfortunately, it did not set correctly. Fortunately more me, I Googled that topic and was directed right back to your site. I followed your directions on how to fix the jam and I was able to save all three quarts that I had made. It, too, tastes wonderful. Thanks, again." 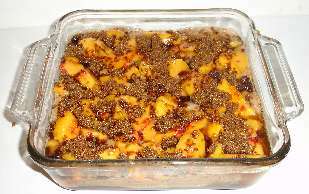 Comments from a visitor on September 01, 2009: "We went peach picking the other day in New Melle and got the BEST peach cobbler recipe off of your site!!! Thanks!"